It’s time? It’s time? Did she just say it’s time?! The day has finally come for Osborn Fiber Studio to unveil our first manufactured-base worsted-weight yarn. We’re super-excited, and hope you catch the infection for soft, brilliant, natural fibers in natural dye. It is named, in part, after the wool-loving pup that is the mascot of the OFS Maryland base: Kirby. At 50% wool and 50% superfine alpaca, this yarn retains the loft and memory of wool, while adding the softness and extra warmth of alpaca. 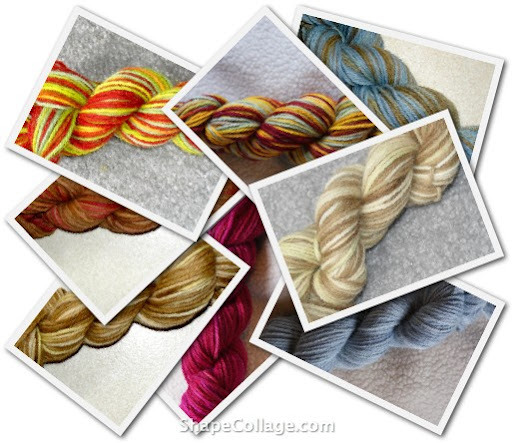 Put up: Our 50-gram skeins have 109 yards of goodness each. Gauge: It knits up consistently at 5 st./in. on US7s, standard for today’s worsted yarns. Colors: We retain our commitment to use dyes found in nature and the grocery store to give you truly unique colors. Mom has dyed up seven colorways for you to choose from, with more on the way. This includes 4 multi, both wild and muted, and fabulous semi-solids. More colors are on the way, including a green (my favorite!) and a dark purple. As she experiments, some rare gems will go up for sale as well, so keep an eye peeled. Pattern support: You’ll see over the season of Lent a few hat patterns and a scarf made from this yarn, great small projects to introduce you to this yarn. Over the summer, we’ll be working up several sweater patterns, so you can be ready to wrap yourselves in this stuff by fall. Quantity: Mom’s made lots available, so there’s a sweater’s worth in any color. She’ll dye more on request, as well. Dyes: Still all-natural, mom has branched out to include Queen Anne’s Lace and Tree Bark in her materials. She’s gifted with experimentation, so you can look forward to more new and interesting things spilling out of her dyepot. We’re both so proud to share these yarns with you, and we hope you’ll give them a try and tell your friends! Take a few minutes to browse the dedicated Kirby Woolpaca page to meet each color up close and personal. I may be new to knitting, but not to color (I am a passionate scrapbooker and paper crafter). I have seen each of these yarns up close and personal – they are truly beautiful! The photos on the dedicated page are very good, you will get what you think you are getting…Happy knitting!